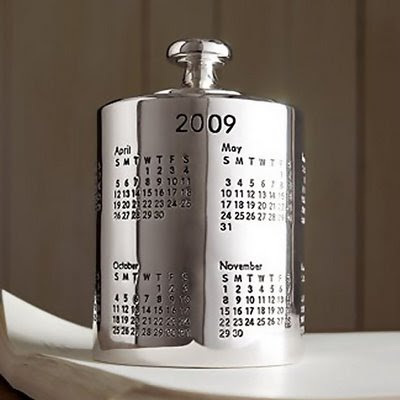 Its time to update the calendars, a few more days are left in the year 2008, and here are some of the calendars we present to you to make a choice. 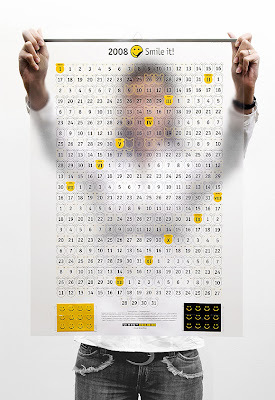 Bubble Calendar is a poster-size calendar (48" x 18" or 122cm x 46cm) with bubbles for everyday, the type is Helvetica Neue and it's printed on thick clear acetate. And you can buy one for $49.95. 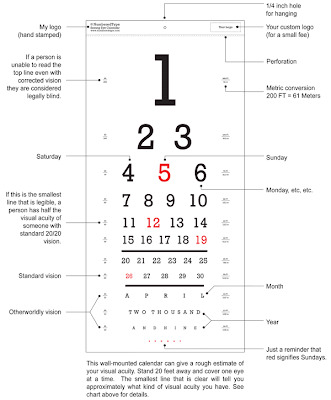 Seeing eye calendar measures 11" x 23", an excellent option to test your vision; Sundays are red, the rest are black - a minor detail. Costs $28.00 each. Not every day we live is successful or joyful, but when you do have a wonderful day then its worthy of making it noticeable in your calendar. So when it's a happy day, then you can make it evident with a yellow smiley and when its something which you didn't like, then its with a black emoticon. Then you have something to look and compare for yourself how many times you have been joyful.